Objective The aim was to address the controversy that exists over the extent to which auditory processing disorder (APD) is a separate diagnostic category with a distinctive psychometric profile, rather than a reflection of a more general learning disability. Methods Children with an APD diagnosis (N=25) were compared with children with dyslexia (N=19) on a battery of standardised auditory processing, language, literacy and non-verbal intelligence quotient measures as well as parental report measures of communicative skill and listening behaviour. A follow-up of a subset of children included a parent report screening questionnaire for Asperger syndrome (Childhood Asperger Syndrome Test). Results There were similarly high levels of attentional, reading and language problems in both groups. One peculiarity of the APD group was a discrepancy between parental report of poor communication and listening skill disproportionate to expectations based on standardised test performance. Follow-up assessment suggested high levels of previously unrecognised autistic features within the APD group. Conclusions Children diagnosed by audiological experts as having APD are likely to have broader neurodevelopmental disorders and would benefit from evaluation by a multidisciplinary team. There is, however, debate over the validity and reliability of commonly used APD assessments, definition of APD and possible misidentification of learning problems as APD.5 It has been suggested that APD is not a separate disorder but rather is a reflection of an attention deficit, a learning disability or a language disorder. It has been suggested that the diagnosis a child receives is partly dependent on the professional who assesses them. In other words, an audiologist would diagnose APD in cases where an educational psychologist or speech therapist would diagnose dyslexia or specific language impairment (SLI).6 Note that auditory processing problems may co-occur with specific learning disabilities, and some have suggested that they may be causally related.7 The significance of auditory processing difficulties is one that has been widely researched and remains controversial.5 ,8 In this study, we focused on whether the psychometric profile of children with an APD diagnosis differed from that of children with dyslexia. During an initial assessment, all participating children completed a detailed psychometric battery comprising standardised assessment and parent report measures. On the basis of our findings, a follow-up assessment focusing on a screening assessment of autistic features was conducted with a subset of children from both APD and dyslexia groups. ▶ Auditory processing disorder (APD) is diagnosed on the basis of listening difficulties and poor performance on tests of auditory processing despite a normal audiogram. There is debate over whether APD is a separate diagnostic entity in its own right with a distinctive psychometric profile, or whether it is a reflection of a more general learning disability. ▶ Children with a diagnosis of APD have high levels of attentional, reading and language difficulties. A substantial minority may also have autistic features. These children are therefore likely to benefit from evaluation by a multidisciplinary team. Nineteen children were recruited either from local schools or as participants from previous studies; all had a diagnosis of dyslexia by an educational psychologist. For inclusion in the study, dyslexia was defined as a reading or spelling test standard score below 85 and a non-verbal IQ greater or equal to 80 (see Assessments). All participants had normal hearing as indicated by pure-tone audiometric screening test (at 20 dB HL for 250 Hz to 8 kHz13). Parental consent for participation was obtained in accordance with University and NHS ethics requirements. Testing was carried out in a quiet room by a trained examiner. ▶ Wechsler Abbreviated Scale of Intelligence matrix reasoning and block design subtests.14 Non-verbal IQ is calculated as a composite of matrix reasoning and block design subtests. ▶ Test for Reception of Grammar, electronic version (TROG-E).15 The TROG-E is a test of receptive language that assesses comprehension of grammatical contrasts marked by inflections, function words and word order. ▶ Expression, Reception and Recall of Narrative Instrument (ERRNI).16 ERRNI assesses the ability to relate a pictured story, and recall and answer questions about it after a short interval. Children's performance is compared with UK norms according to how much relevant story content is provided, sentence length, comprehension and recall of the story. ▶ Sentence Repetition and Repetition of Non-sense Words from NEPSY.17 These tests, which are sensitive indicators of language impairment,18 tap short term memory. ▶ Test of Word Reading Efficiency (TOWRE).19 The TOWRE assesses the ability to read real words and non-words under time pressure. ▶ The OSCCI spelling test was developed within our research group as a quick and efficient test of spelling ability. Children are asked to write a list of regular and irregular words within a 2 min time limit. Performance norms are based on 58 typically developing British school children aged 6–15 using the regression of score on age to convert to age-adjusted standard scores. ▶ Test takers repeat monaurally presented single word stimuli that have been acoustically filtered to reduce intelligibility or are presented against a background of multitalker babble, as well as single words and sentences that are presented dichotically. Stimuli are recorded on compact disc and presented via headphones. Accuracy of responses is scored and compared with performance norms to provide standard scores. The child version, the SCAN-C, is for use with children aged 5–11, while the SCAN-A is for those aged 12 and above. ▶ Children's Communication Checklist—2 (CCC-2).21 The CCC-2 is a parent-completed questionnaire that can be used to screen for language impairment, to identify pragmatic impairments in children with communication problems and to identify children as candidates for further assessment for an autistic spectrum disorder. The CCC-2 provides norm-referenced scores in 10 linguistic and pragmatic subscales as well as providing an overall index of communicative competence and a social interaction deviance score, which can be used to identify children with a communicative profile characteristic of autism. ▶ Strengths and Difficulties Questionnaire (SDQ).22 The SDQ is a brief screening questionnaire for behaviour problems in children. The 25 items are divided into five subscales; emotional symptoms, conduct problems, hyperactivity/inattention, peer problems and prosocial behaviour. The SDQ also provides an overall index of behaviour problems. ▶ Children's Auditory Performance Scale (CHAPS).23 Respondents rate a child's ability to hear and understand in a range of conditions including noise, multiple inputs and quiet. The CHAPS provides scores for each condition as well as an overall auditory performance index. Recommended performance cut-off scores for referral for APD assessment based on normative performance data from children with suspected APD and controls are reported in the CHAPS manual. ▶ Childhood Asperger Syndrome Test (CAST).24 The CAST is a screening test for autistic spectrum features in children aged 4–11, which was completed by parents of a subset of cases 6–8 months after the rest of the battery. Parents respond with a yes or no to statements such as ‘Does s/he tend to take things literally?’ or ‘Is her social behaviour very one-sided and always on his/her own terms?’ The number of ‘yes’ answers is then totalled. APD and dyslexia groups did not differ in age (means of 10.4 years, SD 2.5 and 10.1 years, SD 1.6 respectively, t(42)=−0.48, p>0.05). There was a higher proportion of males in the dyslexia group (17/19 cases) than in the APD group (15/25 cases), Fisher p=0.04. The two groups were not significantly different in non-verbal IQ (M=98.7, SD 14.8 and M=102.2, SD 11.4, respectively for APD and dyslexia groups, t(42)=0.86, p>0.05). Rates of dyslexia, SLI as well as attentional and auditory processing problems were examined in the APD and dyslexia groups. Dyslexia criteria were as used for dyslexia group selection. SLI was defined as a non-verbal IQ of 80 or better and performance on two or more out of six language tests (TROG, NEPSY sentence repetition, NEPSY non-word repetition, ERRNI storytelling, ERRNI MLU, ERRNI story comprehension) below −1 SD. Around half (13 of 25, 52%) of APD children would also fit a diagnosis of either SLI, dyslexia or both. A relatively high proportion of children in the dyslexia group would also fit a diagnosis of SLI (11 of 19, 58%). The proportion of children who fit a diagnosis of SLI was not statistically significantly different between the APD group and the dyslexia group (Fisher p=0.36). Hyperactivity/inattention was identified using recommended cut-off scores for the parent-completed SDQ and classifications according to ‘normal,’ ‘borderline’ and ‘abnormal’ cases.22 Around 10% of the general population would be expected to score in the ‘abnormal’ range, with an additional 10% in the ‘borderline’ range. The proportion of abnormal cases was 37% and 46% for the dyslexia and APD groups, respectively. The proportion of abnormal and borderline cases combined was around 50% for both dyslexia and APD groups, not statistically significantly different from each other (Fisher p=1.00). Using UK norms, 40% (10 of 25) of the APD group and 22% (four of 18) of the dyslexia group scored within the ‘borderline’ or ‘disordered’ range. These proportions were not statistically significantly different (Fisher p=0.32). One would expect around 16% of a random sample to score in this range. Note that a surprisingly low proportion of the APD group scored in the clinical range on the SCAN, given that their original diagnosis was partially based upon SCAN performance. The reasons for this are discussed in detail elsewhere.26 Briefly, the main reasons are as follows: (1) use of inappropriate US-based norms with UK children and (2) original diagnosis of APD on the basis of poor performance on at least one of four SCAN subtests rather than on the total score, a practice that inflates type 1 error and positive identification of APD. Group performance on standardised tests was examined via analysis of variance (ANOVA). Results are reported in the form of composite scores for language and literacy. The ‘language composite’ score is an average of the standard scores of six language tests (TROG, NEPSY non-word and sentence repetition, ERRNI story telling, MLU and comprehension). The ‘literacy composite’ is the average of the standard scores of three literacy tests (OSCCI spelling, TOWRE word and non-word reading). The mean composite scores are shown in table 1. Unsurprisingly, as the group was selected on the basis of poor literacy skills, the dyslexic group did significantly worse on the literacy composite, although both groups' average literacy score was below −1 SD. Groups did not differ significantly on language composite or SCAN composite score. For parent-completed questionnaires, the APD group scored worse on the CHAPS listening behaviours questionnaire. There was no difference in overall CCC-2 general communication composite (GCC) score. An ANOVA was carried out to compare the average score on each CCC-2 subscale between groups. Both groups scored similarly low on speech, syntax and semantics (an average subscale score is 10 with SD 3, shown in figure 1 by a dotted line). After adjusting for multiple comparisons (p<0.005), there were no significant differences between groups on any subscale. 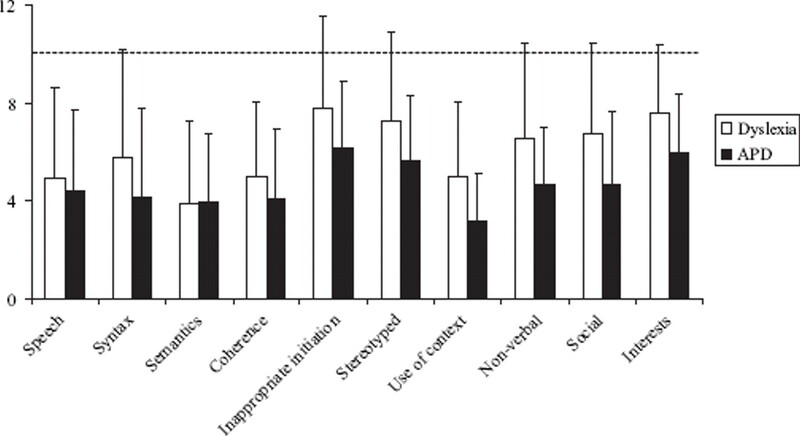 ‘Use of context,’ ‘non-verbal,’ ‘social’ and ‘interests’ subscales were approaching significance (p=0.02–0.06). These subscales are associated with autistic spectrum disorders.27 Overall, both structural language and pragmatic problems were a feature of children with suspected APD. Average Children's Communication Checklist—2 subscale performance for auditory processing disorder (APD) and dyslexia groups. Error bars represent SD. The dotted line represents normative average performance. During evaluation of individual test results, it was noticed that parents of APD participants tended to rate their children less well on the CCC-2 than their child's performance on standardised language tests would suggest. This tendency was examined statistically. GCCs from the CCC-2 were converted to standard scores for comparison with the standardised language composite to have a mean of 100 and a SD of 15. The magnitude of the discrepancy between parental communication checklist and standardised language test was then calculated as the language composite minus the standardised total CCC-2 score (DISCREP). There was a group difference in the magnitude of the average discrepancy score, with the APD group significantly higher (APD M=24.32, SD 11.99, dyslexia M=16.88, SD 11.29, t(41)=−2.10 p<0.05, r=0.31). One possibility that may explain the discrepancy between parent report of poor communicative competence and relatively good standardised test performance is that while these children may have a relatively good structural language, they have difficulties using language appropriately and effectively in more demanding communicative situations. CCC-2 subscales on which group differences were approaching significance were associated with autistic spectrum disorders, with the APD group being rated worse on these pragmatic subscales (though non-significant after correction for multiple comparisons). This raised the question of some children with a diagnosis of APD having unidentified autism spectrum disorders, leading us to obtain approval from the NHS Ethics Committee to obtain additional information from the CAST, 6–8 months after the initial study. Valid CAST questionnaires were received from the parents of 12 dyslexia and 18 APD participants. Average CAST raw scores were significantly higher in the APD group than in the dyslexia group (11.1 SD 5.5 vs 5.2 SD 2.3, t(28)=−3.4, p<0.01, r=0.54). The recommended cut-off score for identification of possible clinical cases is 15. Applying this criterion yielded six cases within the APD group (33%) and no cases within the dyslexia group. This difference was marginally non-significant (Fisher p=0.06, two-sided). There was no correlation between DISCREP and CAST raw score (r=0.27, NS). We were interested in whether children diagnosed as having APD have a distinctive pattern of psychometric performance, and whether the pattern differed from that of children with dyslexia. Around half of the children diagnosed as having APD would fit a diagnosis of dyslexia or SLI or both. Conversely, the dyslexia group scored similarly to the APD group on the SCAN test of auditory processing. A high prevalence of attention/hyperactivity problems was also a feature of both groups. While there was a trend for the APD group to do worse than the dyslexia group on all the behavioural measures, the only significant difference in performance between groups was on literacy measures, where the dyslexia group, who had been selected on this basis, did worse. Average literacy scores for the APD group were also poor. In terms of severity of attentional, reading, language and auditory processing skills, the difference between APD and dyslexia children is quantitative rather than qualitative, with APD diagnosed children tending to have more severe problems. One characteristic that did distinguish between these two groups was that in the APD group, there was an unusual discrepancy (DISCREP) between parental ratings of poor communicative competence or listening behaviours and standardised test performance (standardised language tests and the CCC-2, and the CHAPS and the SCAN). We considered the possibility that this might indicate that children who receive a diagnosis of APD have elevated levels of autistic features, since pragmatic difficulties are often not detected on formal psychometric tests. The average score on a parental report screening test for ASD (the CAST) was significantly higher in the APD group than in the dyslexia group. Thirty-three per cent of the APD group (six children) scored above the clinical cut-off on the CAST. Asperger syndrome had been formally diagnosed for only one of the six APD children who scored in the clinical range on the CAST. In summary, children diagnosed as having APD did not differ qualitatively from those with dyslexia in their performance on psychometric tests of IQ, auditory processing, language or literacy, though there was a tendency for children with APD to perform worse across all measures. In contrast to those with dyslexia, children with APD showed a discrepancy between parent report of poor communicative competence and relatively good performance on standardised language tests. We suggest that pragmatic problems associated with autistic spectrum disorder, to which standardised tests are largely insensitive, may partially explain this discrepancy. The most striking finding was that a third of children with an APD diagnosis fell within the clinical range on a screening questionnaire for Asperger syndrome, though ASD had not been formally recognised for most of these cases. This finding deserves further investigation with a larger sample of children with suspected APD. It may be useful to screen children referred to APD clinics for ‘listening difficulties’ for communication problems associated with unrecognised ASD. Effective management might then centre on remediating these children's pragmatic difficulties. Many children with APD do have demonstrable learning problems, though it is unclear to what extent their reported listening problems are due to actual difficulties with auditory processing, language difficulties or ASD. This study was funded by Deafness Research UK. Thank you to T Sirimanna (Great Ormond Street Hospital), F Tweedy (Manchester Royal Infirmary), M Burton (John Radcliffe Hospital) and I Vanniasegaram (St Georges Hospital) for help with recruitment of subjects.
. Auditory processing disorder—from screening to diagnosis and management—a step-by-step guide. Audiol Now Winter 2005;47–55.
. The auditory processing battery: survey of common practices. J Am Acad Audiol 2002;13:93–117; quiz 118–19.
. Survey of care pathway for auditory processing disorder. Audiol Med 2006;4:12–24.
. Auditory processing disorders: consensus statement by the German Society for Phoniatry and Paedaudiology. HNO 2007;55:61–72.
. Auditory processing disorder in relation to developmental disorders of language, communication and attention: a review and critique. Int J Lang Commun Disord 2009;44:440–65.
. Clinical decision-making in the assessment and intervention of central auditory processing disorders. Lang Speech Hear Serv Sch 1999;30:345–52.
. Improving language and literacy is a matter of time. Nat Rev Neurosci 2004;5:721–8.
. Auditory processing in dyslexia and specific language impairment: is there a deficit? What is its nature? Does it explain anything? J Phonetics 2003;31:509–27.
. SCAN-A: a test for auditory processing disorders in adolescence and adults. San Antonio, TX: Psychological Corporation, 1994.
, ed. SCAN-C test for auditory processing disorders in children—revised. San Antonio, TX: Psychological Corporation, 2000.
. Frequency (pitch) and duration pattern tests. J Am Acad Audiol 1994;5:265–8.
. Random Gap Detection Test. St Louis, Missouri, USA: AUDiTEC, 2000. British Society of Audiology. Recommended procedure. Pure tone air and bone conduction threshold audiometry with and without masking and determination of uncomfortable loudness levels. 2004 [cited July 2005]. http://www.thebsa.org.uk/docs/RecPro/PTA.pdf [accessed 22 March 2010].
. Wechsler Intelligence Scale for Children (WISC-III UK), 3rd edn. Oxford: Pearson Assessment, 1991.
. Test for Reception of Grammar—Electronic (TROG-E). Oxford: Pearson Assessment, 2005.
. Expression, Reception and Recall of Narrative Instrument (ERRNI). Oxford: Pearson Assessment, 2004.
. NEPSY. Oxford: Pearson Assessment, 1997.
. Psycholinguistic markers for specific language impairment (SLI). J Child Psychol Psychiatry 2001;42:741–8.
. Test of Word Reading Efficiency (TOWRE). Bloomington, MN: Pearson Assessment, 1999. American Speech-Language Hearing Association. (Central) Auditory Processing Disorders. American Speech-Language Hearing Association, 2005:1–20.
. Children's Communication Checklist (CCC-2). Oxford: Pearson Assessment, 2003.
. Children's Auditory Performance Scale. Tampa, FL: The Educational Audiology Association, 1998.
. The CAST (Childhood Asperger Syndrome Test): test accuracy. Autism 2005;9:45–68.
. The SCAN-C in testing for auditory processing disorder in a sample of British children. Int J Audiol 2007;46:780–6.
. Temporal auditory and visual motion processing of children diagnosed with auditory processing disorder and dyslexia. Ear Hear 2009;30:675–86.
. Using a parental checklist to identify diagnostic groups in children with communication impairment: a validation of the Children's Communication Checklist—2. Int J Lang Commun Disord 2004;39:345–64.
. Profile and aetiology of children diagnosed with auditory processing disorder (APD). Int J Pediatr Otorhinolaryngol 2008;72:483–9.
. Autism: explaining the enigma. Oxford: Blackwell Publishing, 2003.
. Speech-in-noise perception in high-functioning individuals with autism or Asperger's syndrome. J Child Psychol Psychiatry 2004;45:1107–14.
. Autism and hearing loss. J Autism Dev Disord 1999;29:349–57. Funding Deafness Research UK, 330–332 Gray's Inn Road, London WC1X 8EE. Ethics approval Ethics approval was provided by the Oxfordshire REC B, University of Oxford Ethics Committee.